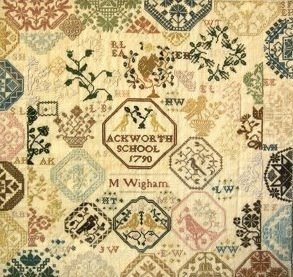 I am very pleased to have started stitching on the Ackworth School “Mary Wigham” sampler today. Situated near Pontefract in Yorkshire in the North of England, Ackworth School was built to be a foundling hospital, but in 1779 a school was founded there by Sir John Fothergill. Mary Wigham was a girl from the region who attended Ackworth between 1788-1791. Her piece is important for the history of the samplers as it is the first known with medallions. Mary Wigham worked her sampler in 1790 – almost 220 years ago! Her sampler is under the care and conservation of the School, and Needleprint is releasing a section of the chart every week via download so that needleworkers everywhere will be able to complete Mary’s breath-taking sampler for themselves. Six of the nine sections have been released thus far, but I am only just starting it today, so I look forward to happy stitching for many weeks to come!